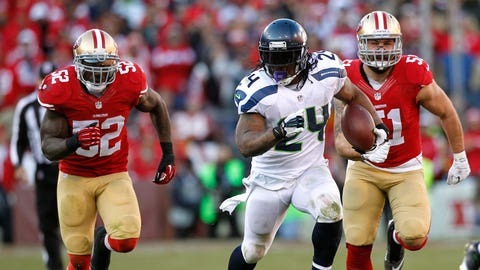 Marshawn Lynch and the Seattle Seahawks can run but they can't hide from NFC West divisional rival San Francisco. How tough is the NFC West? The Seahawks and 49ers are 1-2 in the latest Power Rankings and the Cardinals are better than two division leaders — and still unlikely to make the playoffs. Just beating the Giants on the road wouldn’t have been much to brag about, but completely shutting them out and doing it in the 1 p.m. ET time slot for a West Coast team is something to pat yourselves on the back about. The Niners have now won nine of their last 11 and four straight. No team has more wins since Week 4 this season. The Broncos had just 18 rushing yards against the Chargers on Thursday night after averaging 124.4 in the first 14 weeks. If the Panthers win out, they will win the NFC South. The Saints still control their own destiny in the NFC South but a loss on Sunday will drop them from the No. 2 seed to the No. 5 seed. The Chiefs’ 56 points were the second most in franchise history, and Jamaal Charles was one touchdown shy of joining Gale Sayers, Dub Jones and Ernie Nevers as the only players to ever score six touchdowns in a single game. Shane Vereen was supposed to be a difference maker in this game; instead he finished with just two carries and three receptions for a grand total of 21 yards. The Bengals had a chance to overtake the No. 2 seed in the AFC. Instead, they didn’t even clinch a playoff spot. The Cardinals may finish the season with a better record than two of the four NFC divisional winners … and still miss the playoffs. Dwight Freeney who? With his one sack against the Texans on Sunday, Robert Mathis now holds the single-season franchise record as well as the career franchise record in sacks. With the win on Monday night, the Ravens maintain the sixth seed as they hold the head-to-head tiebreaker against the Dolphins, who also have an 8-6 record. Ryan Tannehill picked a really good time to have the best game of his NFL career. His 23 passing touchdowns this season are the most for a Dolphins quarterback not named Dan Marino. The Chargers held the ball for 38:49 on Thursday night. Philip Rivers is now 5-4 against Peyton Manning in his career. Chicago had allowed a 100-yard rusher in every game since Week 7, but Cleveland’s leading rusher on Sunday had just 38. With Monday night’s loss, the Lions fell from the fourth seed all the way down to ninth in the NFC. Nick Foles posted a career high in passing yards. DeSean Jackson posted a career high in receptions. The Eagles lost by 18 points to the Vikings. The Packers now have back-to-back wins by a combined two points. Dallas in December. Enough said. Antonio Brown is quickly becoming one of the most dangerous players in all of the NFL, both as a receiver and a returner. When the Rams are good, they are really good. But when the Rams are bad, they are really bad. They happened to be good on Sunday. The Vikings’ 48 points were the most for the franchise since my 1998 offense led by Randall Cunningham, Robert Smith, Cris Carter and Randy Moss put up 50 in Week 16 of 1998. The Titans erased a 17-point deficit with just four minutes remaining to force overtime … and then lost. Geno Smith’s 21 interceptions isn’t even the worst for a New York quarterback this season. After starting the season 2-9, the Falcons have now won two of their last three, and their last two losses have been decided by a combined five points. Eli’s five interceptions tied a Giants’ single-game record; he now leads the NFL with 25 picks on the season. Mike Glennon has thrown at least one pick in each of the last three games, and his completion percentage dropped 12 points while his yards per game dipped to 149.7 from 227 yards per game. E.J. Manuel posted his second-best completion percentage of the season and now has three games with a passer rating over 100. The kid has a high ceiling. The Raiders had seven turnovers in the game yet still somehow managed to score 31 points. The Jaguars posted a season-high four sacks, but their three-game winning streak was snapped. The Browns have lost three straight home games and are now officially eliminated from the playoffs. In each of his two career starts, Kirk Cousins has thrown for better than 300 yards and two touchdowns, but it was probably his two interceptions that were the difference on Sunday. The Texans are now 0-12 lifetime against the Colts when playing in Indianapolis.